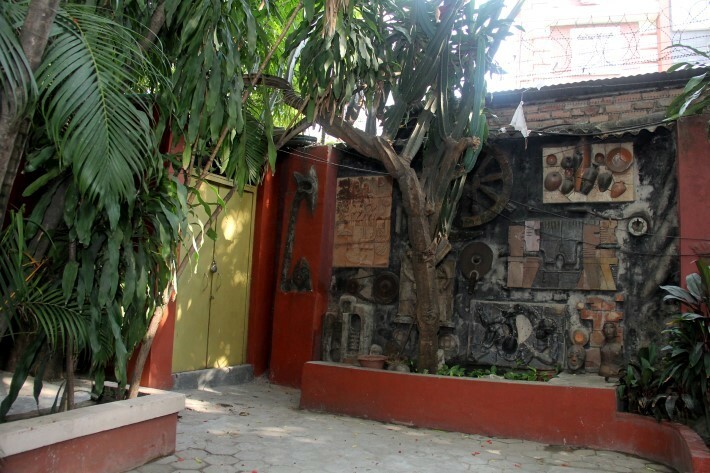 After the completion of his commissions, when Deviprasad left the space, artists of Kolkata – led by Late ParitoshSen and Amitava Banerjee – took initiative to preserve the working space and turn it into the Kolkata Regional Centre of Lalit Kala Akademi. Finally the Centre was inaugurated by Late JyotiBasu, the then Honourable Chief Minister of West Bengal. 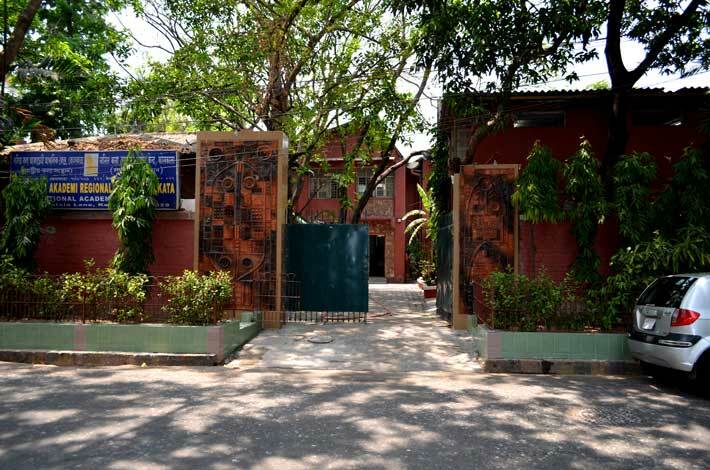 The Centre is having studio facilities for the artists in painting, sculpture, ceramic and graphics. The Centre has also acquired a plot of land 32 kotha at 85, A.J.C.Bose Road, Near Moulali for the development near future. The vision of the Regional Centre (RC), Kolkata is promoting the cultural activities in the states of West Bengal, Assam, Tripura, Manipur, Mizoram and Nagaland; and hence, in synchronization with the mission of the Lalit Kala Akademi (LKA) by contributing to the cultural unity of the Region, as well as the country as a whole. This vision is to be pursued by recognizing the diverse differences and integral unity of the states under this Region and their people as two sides of the same coin. The Centre knows that various genres of traditional and avant garde art practices have evolved as different ways to express the same human urgency for self-emancipation – both individual and collective. Development of all the various faculties of human entity – lifestyle and art, utility and beauty, necessity and embellishment, economics and culture, heritage and modernity, resources and management, knowledge and skill, thought and action, planning and application, production and decoration, ecology and linguistic – all are mutually reinforced and structurally coexistent. The RC, Kolkata, proposes to attain its vision by recognizing, exhibiting, disseminating and furthering the indelible connection between life and the arts, by transcending temporal and spatial boundaries of the past and present, natural and social sciences, states and regions, and so on. It proposes to combine ex situ display within situ revitalization, and the collection of objects with recollection of ideas. It includes, rather than merely a metropolitan minority, all the rural and hinterland communities of the Region – irrespective of sectarian, denominational, racial persuasions. The Centre also builds bridges of intercultural and interdisciplinary understanding, in a comparative, historical and future-enhancing perspective. The RC, Kolkata, looks at itself as a platform for asserting the Indian genius of uniting all the diverse aspects of nature – culture and development, mind and body, phenomenal and nominal; in order to make arts living, life artistic. The Centre also serves the intension of LKA to decolonize and reinvent the cognitive categories of art in education, and develop a counter argument and strategy through arts, to stem the engulfing tide of tech-savvy synthetic culture that has been released through the planet earth over the past two centuries. As a whole, the objectives of the Regional Centre are nothing but incidental, mostly identical and a cohesive extension to the mission and vision of LKA for the promotion of cultural unity of India. Art Education is to be promoted, to reverse amnesia and aphasia, loss of memory and speech of the arts and associated knowledge systems, among the myriad oral language communities. Interface of folk, tribal, traditional and contemporary visual and other arts is to be ensured for bringing about a convergence of continuity and innovation. To participate in shaping the Museum of Relations (MOR), conceptualized by LKA, to transform Museum of Objects into de-museumising of ideas, habitats and communities. Regional, national and international Art Events (AE) are to be converted into active research instruments for regenerating the living museum of the country, curated by its communities. Diaspora of Indian ideas, patterns, motifs of art abroad; and international Diaspora in India are to be brought into conversation. Promotion of research in arts in their diverse dimensions through recognition and assistance. The cultural unity of India will be promoted through its arts that have reconciled diverse differences, and bound the wounds of the world through an all embracing humanism. Survey, documentation, exhibition and dissemination of community arts are to be taken up. India’s untold riches, art treasures and ideas have to be brought to the fore, to rebuild it on its foundations of civilization, strengthen these through globally available knowledge, nurture an integrated human personality and solidarity, and to enrich and humanize the world further. A Public Art Movement (PAM) is to be advanced to generate employment among disadvantaged communities. Inter-departmental, inter-institutional, intercultural, inter-state, inter-regional and international collaboration and synergy has to be put in place to create field initiatives, exhibitions, seminars, performances and publications. Publication in folk, tribal, traditional and contemporary visual and other arts. Generation and maintenance of funds for building up infrastructure in arts. To function regionally with the consent, approval, support and cooperation of the Headquarters (HQ) of LKA, New Delhi. To make use of the funds allotted by the HQ in the best possible way in order to promote cultural activities in the Region. To purchase land, own property of all kinds and to maintain, sell, mortgage or otherwise dispose of and deal with the same within the Region. To create a Reserve Fund, Sinking Fund, or any other special fund, whether for depreciation or for repairs, improving, extending or maintaining any of the properties or rights of the Regional Centre and or recoupment of wasting assets and for any other purpose for which the Centre deems it expedient or property to create or maintain any such fund or funds, provided that no part of grants received from the HQ or any part of income derived out of expenditure met from the HQ shall be transferred to any such funds without the prior approval of the HQ. To help the HQ in creating and establishing the Lalit Kala Artists’ Welfare Trust with the money available in Artists Aid Fund and social security and to credit all future funds under these heads to the Trust. To do all such other acts either on its own or in conjunction with other organizations or persons as the RC may consider necessary, incidental or conducive to the fulfillment of the above said objectives.